12-2-15 - DREAM As the dream started, ahead of me was a very tall grassy hill that was terraced in multiple layers. On each layer stood a line of people standing evenly spaced. These people were all wearing black clothing such as worn in med 20th century - like 1960's or before. Then as I got closer, the people came down from the hill and walked in a single file parade past the window of my apartment. (I was on the second floor looking down at them and the street was of modern blacktop). These people were of smaller than normal stature, the tallest one being perhaps 5 feet tall, and all were thin build, all wearing black. When that parade by, then a parade went by, then a parade of single file red row boats went by, with nobody in them. They went by like they were on wheels. I got involved at one point because I had to cross the street and got caught up in traffic because there didn't seem to be any rules for watching out for pedestrians and there were little red ants running all over the street which was more annoying than dangerous or scary. Finally, I went to a park then, where the costume awards were to be given out. There stood President Obama with a large white Styrofoam box with white stuffing, and in the center of the box was a toy size figure of a yellow bird I recognized as Big Bird. After discussing this dream with Joe Mason, my eyes got super-tired to the point where I had to close them. As soon as I closed my eyes, I saw a tiny yellow Big Bird at the very bottom of the scene, wearing clothing that were military, and above him was a white sign, with a very clear sign on which was printed "Follow me"
Following this experience I got very curious about the meaning of Big Bird in this dream. As a coincidence, I turned the television on to watch the news, and part of the news showed Michelle Obama in the White House, with an 8' 2" yellow Sesame character of Big Bird, and she was exeeercisibg with him and doing a two-step dance with him, making a fun video to distribute to kids in classrooms to teach them to eat carrots and other veggies to be healthy. That made even more curious as to why Big Bird was with Michelle Obama. The characters on Sesame Street suffer from many disorders in the DSM-IV. Geek Pride welcomes guest blogger Kevin O'Kelly, a writer whose work has appeared in the Boston Globe and the literary journal Alligator Juniper. 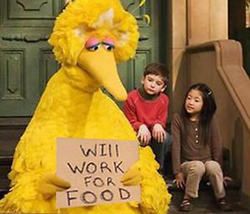 When Mitt Romney said he would "fire Big Bird" in the first presidential debate, he was threatening to cancel a show that has been proven crucial(link is external) to the education of American children. But the instructional benefits of Sesame Street go beyond basic vocabulary and math. Arguably, it also educates American children about an issue that will affect many of them as adults: mental illness. The characters on Sesame Street suffer from many of the disorders described in the American Pyschiatric Association's Diagnostic and Statistical Manual (DSM-IV). Or as a college roommate of mine put it: "Sesame Street is nothing less than a window into madness." Let's start with the obvious: Cookie Monster has an eating disorder and Count von Count is OCD. Grover, who sometimes thinks he's a superhero, has some kind of delusional disorder. Ernie and Bert present more difficult cases. Most amateur psychologists on the Internet believe Ernie has a case of Attention Deficit Disorder, which accounts for some (but not all) of his bizarre behavior. Remember the time Bert couldn't sleep because of the sound of a dripping faucet, and Ernie's response was to turn on the radio to drown out the faucet? I suspect some profound mental disability. Bert's various compulsions and obsessions (exercising, collecting paper clips, the letter W) point to Obsessive Compulsive Personality Disorder. Individuals who suffer from OCPD often have intimacy issues, which would explain why Ernie and Bert have been sleeping in separate beds for forty years. The contrasting personalities and behaviors of Ernie and Bert also serve as an introduction to Freud's concepts of the id and the superego. Ernie is all impulse; Bert is overly concerned with following rules. There's no consensus on Oscar the Grouch. Some say Anti-Social Personality Disorder. But the author of the website A DSM-IV Look at Sesame Street disputes this diagnosis, making a compelling case that Oscar suffers from Oppositional Defiant Disorder(link is external). Look argues that this is a case of Shared Psychotic Disorder(link is external), the transference of a delusion to others. By now I'm sure you're wondering what psychological disorders the rest of the cast of Sesame Street illustrate. Don't think too hard about it. As Freud might have said, "Sometimes a muppet really is just a muppet." Kevin O'Kelly lives in Somerville, Massachusetts. His writing has appeared in the Boston Globe and the literary journal Alligator Juniper. Gaze, asymmetrical smiles, and facial illustrators are potent dominance cues. Something interesting happened on the way to November’s election at a stop known as the first debate. On one side stood the incumbent president, the holder of the highest position in the land, if not the whole world, a position of unquestioned power and prestige. On the other side stood the contender to the post, apparently the underdog, and probable loser. But the tables turned, empowered by several well-placed dominance gestures by the challenger-–moves that would make any commander take notice. Social psychologists who study the “nonverbal” underbelly to human communication have identified a behavior called, “visual dominance.” It involves looking but the key thing is not amount of eye contact but the ratio of looking-while-speaking to looking-while-listening. Visual dominance is not staring or at least not staring in the manner of young boys or smitten lovers. Instead, the dominant person in a conversation looks when he or she is talking and mostly looks away when he or she is “listening.” In contrast, the more submissive person looks more while he is listening and averts his gaze when he is talking (if he is even given the chance to talk). The visual dominance pattern says in effect, “Listen up. I’m talking!” Mitt Romney had the floor; Barack Obama moved to the side. Other nonverbal signs signaled Mitt Romney was taking no backtalk this night. He smiled a good deal during the debate. That wouldn’t normally suggest a dominance display until you look more closely and see that his smiles were not of the friendly or happy kind (although after the debate he was probably really smiling). The smiling barely made it out of his usually closed mouth. That’s the first clue. Second, Mitt Romney’s smile had a subtle lopsidedness to it, what we psychologists, who study these things, call smile asymmetry. Asymmetrical smiles are strategically self-assured. Third, Mitt’s smile was pretty much fixed in place whenever President Obama spoke. A less subtle version would have been shaking his head throughout but that would have been too obvious. And then there was Romney’s forehead. What are foreheads for? They are the canvas on which one conveys attitude. Romney’s brows were a study in certainty–up, down, drawing together, emphasizing here and doubting there. He wasn’t waiting respectfully in the wings. And did I mention Romney’s interruptions? Marianne LaFrance, Ph.D., is Professor of Psychology and Professor of Women's, Gender and Sexuality Studies at Yale University. Not too surprisingly, topics important to you and me—renewable energy, climate change, ocean protection, clean air, BPA and other toxins, fracking, GMO’s, protection of the environment against wanton drilling, etc., etc., etc.—are virtually never mentioned in these quadrennial verbal pugilistic contests. Here are some worthwhile articles around the web that provide an environmental perspective on why ‘green’ never gets mentioned in the television battle between the blue and red presidential candidates. Just a short quote from the PBS statement: “The federal investment in public broadcasting equals about one one-hundredth of one percent of the federal budget. Elimination of funding would have virtually no impact on the nation’s debt. Yet the loss to the American public would be devastating.” Being a PBS junkie, I concur. The folks at Mother Nature Network published a very interesting article by Russell McLendon, written before this year’s gladiator games began. So there you have it: Politicians—Ignore solar energy at the risk of your political career! 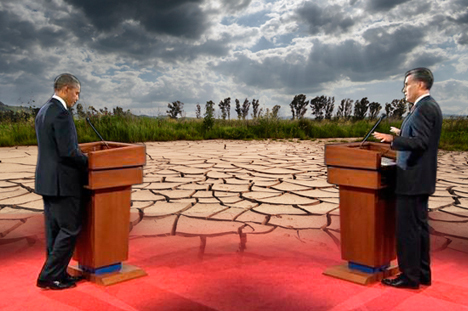 The morning after the first Obama-Romney presidential debate, with the commentators having had a chance to sleep on it, we awoke to a flood of psychologizing. The president had looked tense and acted dismissive, they noted. This hopeful man who had once campaigned on the prospects of the bright future seemed worn down by the minute-to-minute demands of two wars, an economic collapse not of his own making, and a recalcitrant legislative branch. The challenger, an organizational man who seems plucked from the late 1950s and who sees social relations as transactional and facts as provisional, appeared confident and bushy-tailed, ready to deliver old ideas as current revelation. Almost to a pundit, the chattering classes declared that both debaters had been true to themselves, and that as a result the challenger had won the sprawling encounter. He’d missed plenty. 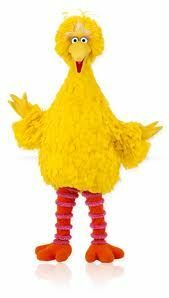 How did Big Bird get to be part of this debate? Sesame Street has come to be seen as part of the larger approach of the remedial Great Society programs and the War on Poverty launched in the 1960s under President Lyndon Johnson. After America’s urban neighborhoods had erupted into riot between 1964 and 1967, American legislators—Democrat and Republican—looked for ways to address the inequality that lay at the root of urban unrest. Policymakers became especially interested in closing the persistent achievement gap in literacy and numeracy that yawned between rich and poor and white and black children. Only a few were thinking of television as a teaching tool. While I was developing and writing The Strong’s exhibit Can you Tell Me How to Get to Sesame Street? (link is external), staffers at the Children’s Television Workshop (now Sesame Workshop) told me that at a crucial point in 1967 it wasn’t Democrats who did the most to put the developing Sesame Street over. The program cleared a fateful funding hurdle when Arizona’s Senator Barry Goldwater, father of the conservative movement in the Republican Party, intervened. The show’s original writer-producer, Joan Ganz Cooney, had first approached Caspar Weinberger (Richard Nixon’s secretary of Health, Education, and Welfare) for support, but subsequently she found Goldwater, (an old friend of her father’s) more forthcoming. The senator wrote Weinberger a letter that Cooney summarized amusingly: “Dear Cappy, Give little Joanie Ganz anything she wants.” And so it wasn’t long before Sesame Street gained bipartisan support for its own line item in the federal budget. With $5 million in foundation and private funding, planning could proceed. In this current mistrustful election season, one faction considers federal involvement in health care, economic policy, the arts, and education a doomed intrusion into economic and personal liberty. But in the late 1960s Barry Goldwater declined to portraygovernment as an enemy of the private sector, and that position allowed him to endorse public television and a partnership with Sesame Street. In 1970, Children’s Television Workshop set up field offices in America's inner cities and rural poverty areas to coordinate outreach to parents and kids and recruit viewers. At about a penny invested in each pair of attentive eyeballs per program, the partnership paid off. By 1973, Sesame Street was reaching 97% of Chicago households with preschoolers. And, by 1978, the show was reaching more than 90% of inner-city preschoolers nationwide. Pollsters declared that Sesame Street had become "an institution with ghetto children" and research proved that the more children everywhere watched the playful program, the more they learned. After nearly four and a half decades, Sesame Street still remains playful, fresh, idealistic, kind, optimistic, stimulating, generous, measurably effective, funny, and fun. Sixty million of us watched the presidential debate. Now, as therapy and penance each candidate should watch at least one hour of Sesame Street.